Unfortunately for the Chancellor, it happened in front of an ITV reporter who live-tweeted the whole episode. 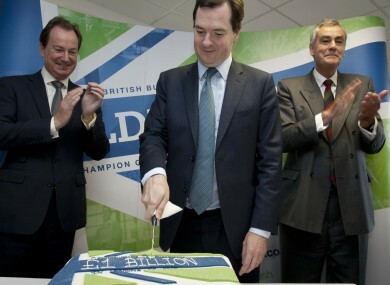 Earlier today, George trying to have his cake and eat it too. THE AGE OF Twitter has made a politician’s life more difficult for many reasons. Mostly because they’re not very good at it. Today though the problem wasn’t from a 140-character gaffe but an actual live event. Just a few hours ago, the Chancellor of Great Britain George Osborne and his aide were caught trying to blag their way into a First Class train carriage with (gasp!) a Standard ticket. After the initial request, the collector seemingly stood his ground, demanding £160 in exchange for a posh seat. Eventually though the thought of the cheap seats was too much. And it wasn’t just Townsend who noticed. Another passenger Mark Townsend also tweeted about how the day’s events unfolded. Things haven’t been this exciting on a London train since Harry discovered platform 9 and 3/4. Email “MP George Osborne caught in First Class without ticket”. Feedback on “MP George Osborne caught in First Class without ticket”.